Americans celebrated Thanksgiving today. As a nation we gave thanks to the Almighty for victory and the end of the war. Most businesses were closed in observation of the holiday. Philadelphians started the day by attending religious services. Every church and synagogue was full as today was truly a celebration of joy and gratitude to God for the gift of peace. At 10:00am open air assemblies and prayer services were held concurrently in the parks, playgrounds and schoolyards of this city. Services were held at Broad Street & South Penn Square outside of City Hall, Washington Square, Rittenhouse Square, Logan Square, Jefferson Square, Fairmount Park, Durham Park at 48th & Lancaster Avenue, Whitehall Commons in Frankford, Wharton Square at 23rd & Wharton Streets, League Island Plaza at Broad Street & Oregon Avenue, Hunting Park at York Road & Hunting Park Avenue, Franklin Field, Carroll Park at 58th & Girard Avenue, Cliveden Park at Johnson & Chew Streets, Cobbs Creek Park and dozens of other locations throughout the city. And over in France the men of the 315th Infantry Regiment known now throughout the world as “Philadelphia’s Own” celebrated the day with a great feast in Damvillers, France. And no group of America’s sons deserved it more. The Regiment was treated to speeches, music and a victory parade by the men which in some ways resembled a Mummer’s parade because of its comedic elements and mimicry. 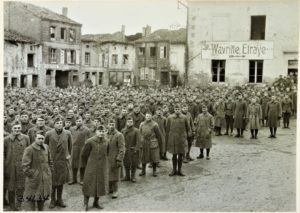 These men whose bravery is celebrated by both the American and French high command had been in the fighting since September 13, 1918 when they took over a section of the front previously held by the French northwest of Verdun on the Meuse River. On September 25, 1918 they advanced with the rest of the 79th Division in the great Meuse-Argonne Offensive. They engaged in battles at Malancourt, Montfaucon, Bois des Ogons, and Madeleine Farm where in just 5 days the Regiment suffered the loss of 30% of its men either killed, wounded or missing. Then in October they were sent to the Woevre sector in the Lorraine region. Here they fought almost continually including at Molleville Farm where the fighting was so fierce that the area was nicknamed “Death Valley”. And they continued fighting right up to 11:00am on November 11 when, as they were scaling the slopes of the Cote de Morimont, they were ordered to stop. These brave sons of Philadelphia fought with the utmost courage and honor and deserve the gratitude and appreciation of all Philadelphians.